Last night we made a plan to wake up early and do a weather check. Since we are rather far in a protected bay, we knew that we would have to walk out to a point to get an indication of the wind. There is a constant breeze that we can feel, it is not blowing hard, but also know that we are quite protected here. We are assuming that further out of the bay the wind is probably much stronger. Also know that there is a high pressure ridge and the Santa Annas are blowing Plan now is to get up at first light, eat and go for a longer walk up the arroyo. Time has become irrelevant out here. We keep track of it to know that we need to get up early for travel and also to give us a feel for what the tides are doing. Each day is a new day for what it has to bring. Every day we see new things even when we have been winded in for several days at the same place. Yesterday a large pod of dolphins sped past us. At our dune camp I had been watching sea gulls drop sea shells to open them and wondered how they learned that behavior. Interesting that I only noticed mature gulls dropping shells. The curlews were out in force there as well. with their awkward looking bills, but quite useful in obtaining the food they need. The natural world is so incredible. We are carrying a radio with us to see if we can pick up any weather reports from So. CA. Unfortunately along with the weather there are also news reports. Hard to listen with any length as it is quite depressing. At night we have been taking turns reading John Muir. Years ago I was in awe of his thoughts and once again I ponder his words. When one thinks of what he did and the joys of discovery he expresses, one or that would be me wants to have him as my mentor. To see things as with new eyes for the first time even having seen them many times before is an attribute I want to follow. Each day is a new day and with it brings so many blessings. Hard to believe the sequence of this day. As we finished eating breakfast, we noticed a calming of the water. Took our tea and once again hiked out to the point and then a little higher. We decided that we would move our campsite to a new location, one that would give us a better view of the sea state and also it would not have a huge tidal flat. Back to camp, pack everything up and walk out to where the tide is just beginning to come in. Had anticipated a short move, but as we got to our campsite that we had chosen, the winds continued to calm so we continued on as well. Around a point we went and even though the tide was against us the wind and swells were pushing us. We were making good time and continued across a bay to another point. Checking out beaches along the way in case we need to bail. Rounding this point we head in to hug the shore and take a break. 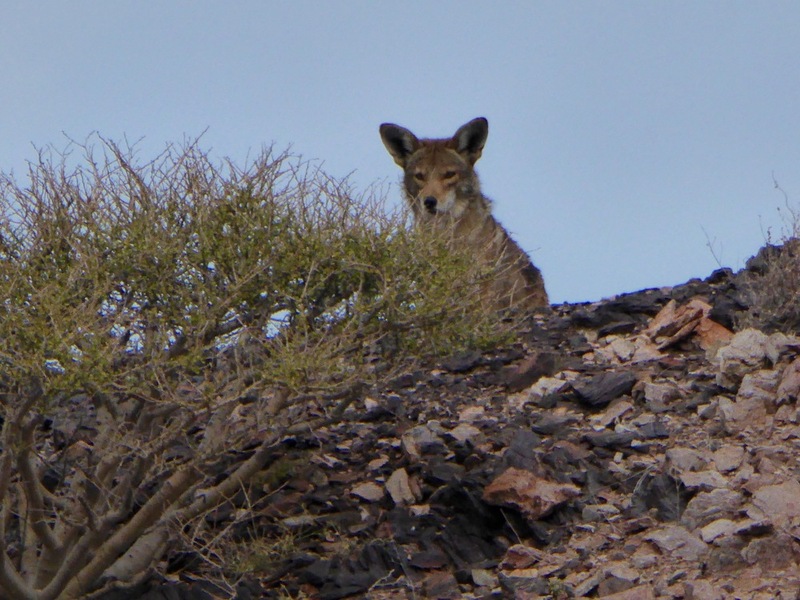 Awaiting at the shore are four beautiful coyotes. They acknowledge us and then move on. Further down the bay are what appears to be several palapas and two complete looking houses that are quite artistically done. No one seems to be around when we paddled past. By this time the wind had become stronger and with the fetch being short we were just dealing with wind and not waves. That was good cause we were flying! Instead of paddling I was using my paddle as a rudder and making good time. Decision time loomed, should we go around another point or take advantage of a beach that we could land at now. With a strong gust of wind hitting us we decided to stop at the beach. After securing our gear we went for a walk with the wind gauge and got readings in the high 30's. Around the point and in the next bay is a yurt resort. We thought we would pay it a visit to see if they might have an updated weather forecast. It was an easy walk cutting across the point. Alas, the only inhabitants were two dogs. One being very friendly whose name on his collar said Chaco. Chaco followed us to our camp and then I walked him back and told him to stay which he obeyed. Don made a delicious dinner tonight. The weather report on the radio said that the Santa Annas will continue to blow for another two days. Not a bad place to be winded in. Lots of exploring to do and who knows we may even have a dog come with us when we go hiking.